There are September & October games not shown above. Click for larger team photo with names. C.H.S. 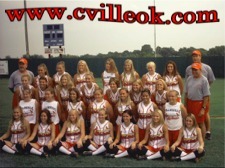 Varsity and JV players (above) waiting for the softball team yearbook photos August 7, 2003. 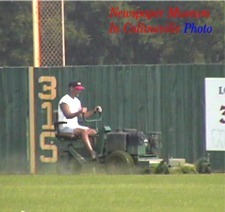 Baseball Coach Tony Reeder keeping the basefield field (next door) trimmed. The Lady Cardinals' Head Coach: Stan Irvine will be assisted by Coaches Phil Davis & Dave Cross.